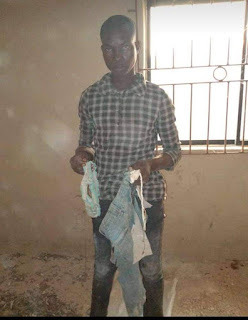 Breaking News: A thief was caught with ladies pants and boxers in student area. Good day to ever reasonable ladokites, this is to bring to your notice that earlier this morning around 3:00am at Adenike along imperial hotel. A thief was apprehend and some female underwear (Pants) was recovered from him. The thief is currently in the custody of the ADENIKE RESCUE GUARD (ARG), as he will be handed over to the security personals for further investigations. Also Parrot FM will be there to take a coverage and also make some inquisitions as the thief is been handed over to the security personal. It is now pertinent to sound the warning to all evil perpetrators that, Adenike of yesterday is not the same of today, as earlier discussed in the meeting held with student and hostel agents last Saturday and a development as promised by the Students' Union President LAUREL will in due time cut across other students residential areas. In view of this we urge all student to inform their agent/landlord once again, to do the needful, as it was concluded in the meeting held, that the security fee for each hostel is just #3000. This should also sound as a warning to lautech student populace most especially the female students, to be very security conscious of there wears most especially their pants.